Do you want to experience life at an American university? Do you want to learn about American culture, daily life, and improve your English skills at the same time? Look no further than the University of North Alabama! We are excited to welcome you to our campus. 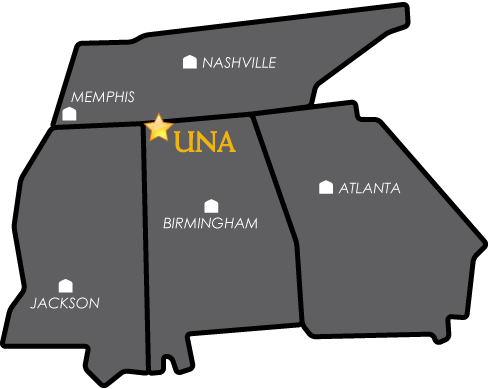 UNA is located in Florence, Alabama, a culturally-rich area in Northwest Alabama. “International High School Camp” (IHSC) offers a unique opportunity for international high school students to experience college life at the University of North Alabama (UNA). The camp will enable students to actively learn American English through daily interactions with friendly local native speakers and gain first-hand knowledge of the American college experiences. Class discussions will revolve around context-based language and learning to help strengthen students’ English proficiency levels and cross-cultural communication skills. Coming to UNA will allow students to interact with American and international students who have been studying at UNA. Students will gain a better understanding of the University of North Alabama, the unique academic programs, scholarship opportunities, and friendly support for international students. To inquire about our Academies or Camps please contact us at oiaservices@una.edu. Please submit the application no later than November 16, 2018.